Radishes are a favorite for snacking and salads, and Cincinnati Market Radish has stood the test of time. 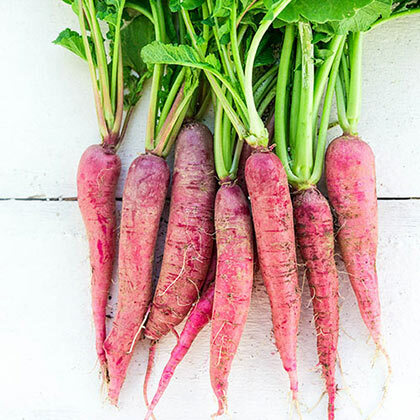 Its crisp, mild flavor and long, tapered roots make this 19th century heirloom variety a favorite for dipping, salads and vegetable plates. Produces high yields of deep pinkish-red roots that grow up to 6 in. long. Radish seeds can be sown directly into the garden in early spring as soon as the soil can be worked. To extend the season, plant at one-week intervals. 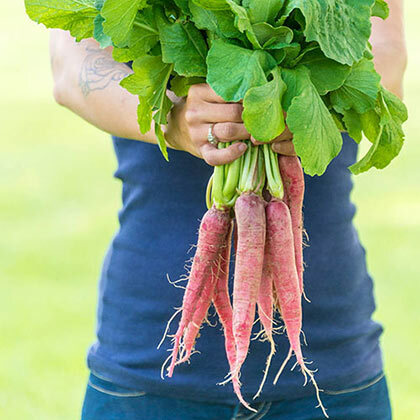 Radish seed can also be planted again in late summer for a fall crop. 25-30 DAYS. HeightRoots are up to 6 inches long, close to 1-inch wide. Spacing2 - 3 inches between plants, 12 - 24 inches between rows. Fruit6-inch, tapered roots are a deep pinkish-red with white flesh. Known for pleasing mild flavor and tender, crisp texture. Soil RequirementsLoose, fertile, sandy, well-drained soil. pH 5.5 - 6.8. Seed CountApproximately 500 seeds per packet. 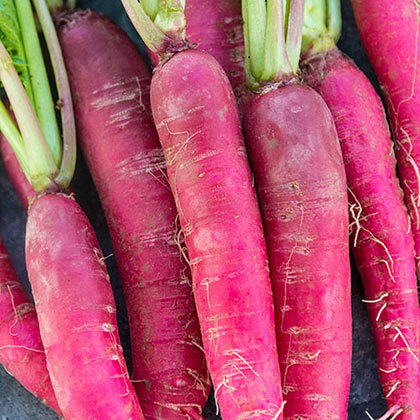 CommentsThis delightful heirloom radish showcases a mild flavor with a pleasingly tender, crisp texture. 6-inch, tapered roots are carrot-like in appearance. Their rich, pinkish-red color brightens salads and vegetable plates. Enjoy this cool season favorite in spring and fall.